The Australian fascination for the game of cricket has always perplexed foreigners: it would seem only natural that, in a land dominated by critters and flora fervently bent on rendering you incapable of walking compounded with the rough-and-tumble Australian temperament, our cousins down under would have long ago modified the rules of the game to permit the wearing of shorts and the proper use of cricket bats to brutally whack each other. However, through meticulous research involving numerous balls to the face, horrid kicks, pathetic drops and excessively aggressive tackling, it is my pleasure to inform you that I have in fact discovered an Australian sport more in line with the form of loosely contained mayhem we had all expected from our favorite southern survivalists. This is Australian Rules Football. Australian Rules Football first entered the athletic repertoire in 1858, after cricketer Tom Wills called for the formation of a “foot-ball club” in a letter to the Melbourne-based Bell’s Life in Victoria and Sporting Chronicle. The sport was supposedly devised to ensure cricket players remained fit in the offseason, although such a claim would appear to be a convenient excuse to introduce bloodshed into Australian sports. The game drew upon all the codes of football invented so far, ultimately creating an epic mixture of both kicking and catching. From rugby, the prolate spheroid and the style of continuous action were adopted, and from soccer came the forward pass. From American football came skimpy clothing. 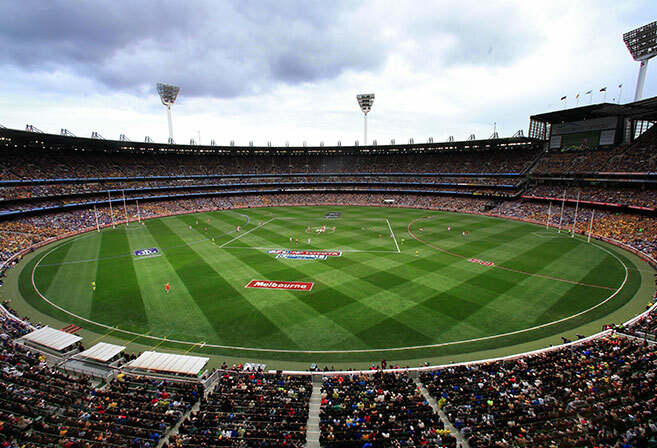 The game is played on a gargantuan oval field, 185 metres long by 155 metres wide. As a result, players must be considerably athletic in order to cover such a great expanse of neatly-trimmed turf. Their cardiovascular struggle is alleviated by the generous use of a large number of players, with a total of 36 individuals taking to the pitch for both teams. Play commences with the center bounce. The objective of the game is for your team to score more points than your opponent in the allocated time. Goals can be scored by kicking the ball between two posts at each end of the field: this grants the scoring team 6 points. If the ball is deflected by an opponent, makes contact with a picket or passes through a rectangular area defined by two “behind” posts, only 1 point will be scored. There are multiple ways of moving the ball downfield. Firstly, one can run with the “footy”, provided it is bounced every 15 metres. Yes, that is indeed correct, you are forced to dribble an ellipsoid. It has a vexatious tendency to either travel in an incomprehensible pattern, or, if bounced semi-correctly, collide violently in between one’s legs. 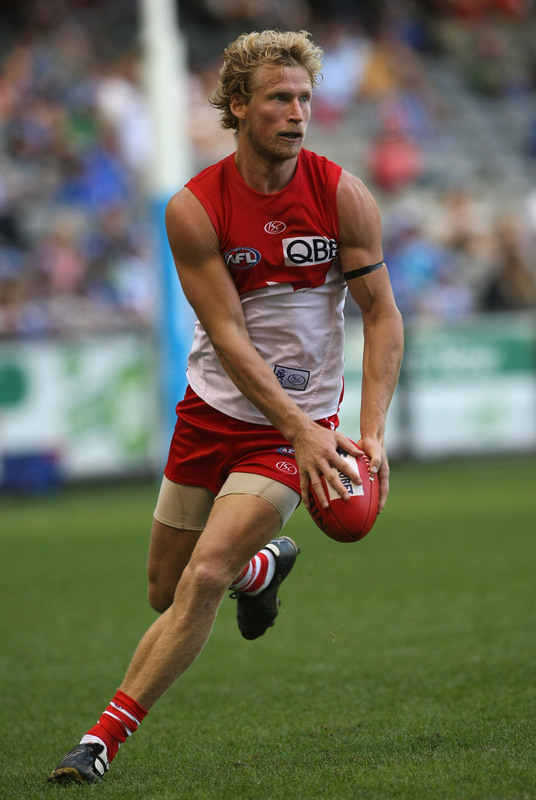 Throwing is strictly forbidden in Australian Rules Football: instead, one must strike the ball with a clenched fist. Pretending to be Joe Montana shall generously grant a free kick to the opposing team. The most exciting aspect of Australian Football is known as the mark. If the ball is kicked more than 15 metres and successfully caught without contacting the ground, this is a mark and a free kick may be taken from the spot of the catch. A “speckie”, or spectacular mark, occurs when a receiver jumps onto a defender’s back to catch the footy. These gravity-defying plays for the ball are a hallmark of the game. And yes, you can tackle, provided you do so below the shoulders. Inflicting permanent brain damage upon adversaries is somewhat frowned upon. Posted in Sports and tagged AFL, australia, football, footy, speckie, sports. Bookmark the permalink.